Disney world is all about fun and excitement as so is the Android operating system, but then it all goes wrong when two new Disney Android phones aka the DM010SH and the DM011SH was announced. Mickey Mouse and all his friends are cute and fun right, but to release two new Disney Android phones is a little too childish is our eyes, maybe we are a little harsh here but even the names of the mobile phones are a little hard to digest. 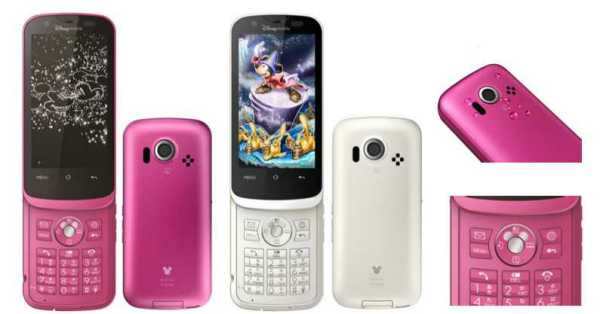 The first smartphone is called the DM010SH, which features Android 2.3 Gingerbread, 4-inch qHD resolution display, 3D-capable, 1GHz Qualcomm MSM8255 processor, Bluetooth 3.0 connectivity, 512MB RAM, 2GB ROM, Wi-Fi and a 8-megapixel camera. The second Disney Android smartphone is called the DM011SH, basically has the same specs as the DM010SH but this one has a smaller 3.4-inch LCD display at 854 Ã— 480 resolution, dustproof and waterproof protection. Ok the specifications seem pretty decent, the DM010SH seems to be the best one here, but come on it is a little childish. Would you really want to own one of the above handsets?